That might already be the case. Data commissioned by Newsweek, based both on student achievement and college readiness indicators, placed Thomas Jefferson as the highest-performing high school in the United States. Nor is that the first such declaration; administrative offices in the school are adorned with several U.S. News and World Report covers crowning Thomas Jefferson at the top of “America’s Best High Schools.” Can TJ, as students affectionately call it, match that sort of hype? Das is planning to begin work in an energy systems research lab in the fall. Roughly half of Thomas Jefferson students are involved in individualized research in any given year, Glazer says, but all seniors are expected to complete a major research project before graduation. There are labs dealing with neuroscience, astronomy, oceanography and other subjects; eventually, the results are presented at symposiums and science fairs. We tour the building-in-progress, and the principal walks over to research plaques encased in glass, excitedly pointing out a satellite a group of students launched into space with help from NASA. The school—or, at least, the building it inhabits—was built in 1964 as Thomas Jefferson High School, a non-selective and non-specializing school that would go on to produce such notable alumni as Foo Fighters frontman Dave Grohl and erstwhile Buffalo Bills kicker Scott Norwood. (His was the missed field goal attempt that famously ended Super Bowl XXV.) In 1985, the school reopened as Thomas Jefferson High School for Science and Technology, shifting toward its current, strictly application-based admissions model and reputation for excellence. In 1988, it became a founding school in the National Consortium for Specialized Secondary Schools of Mathematics, Science and Technology. By then, each class entering the school was required to undergo an extensive admissions process. That process today consists of academic eligibility requirements, an admissions test, two teacher recommendations and an essay. “It’s a holistic process that evaluates their interests,” Glazer says. “There isn’t a process that takes the highest 480 [test] scores and says, ‘Let’s just go with them.’” According to the principal, the school accepts about one out of every six applicants—a rate that’s in line with some of the country’s most selective private colleges. Where Thomas Jefferson doesn’t quite compete with selective colleges is in its socioeconomic diversity figures. Despite its public magnet status, the school population reflects the solidly upper-middle class northern Virginia suburbs; according to a recent survey, just 2 percent of its students qualify for free or reduced-price lunch programs. Glazer emphasizes that the school itself has no hand in its own admissions process, which is handled by the division office for the school district (“It’s kind of a black box—I never see who applies”). Scott Campbell, a history teacher–turned–assistant principal, served on a committee focusing on how teachers could promote diversity at the school. “We’re aware there’s a need,” he says, and despite a sense of faculty powerlessness over admissions decisions, the strategy has been to reach out to underserved communities, promote a love of STEM, and encourage middle school students to apply. Ria Galanos, a faculty member who claims to be the nation’s only high school computer science teacher/cheerleading coach hybrid, concurs. “They want to know the ‘Why?’ behind everything,” she says of her students. 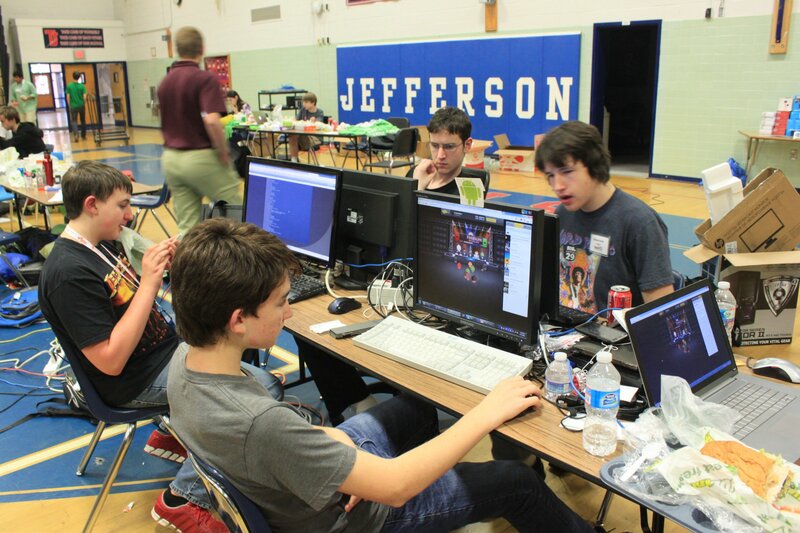 Several years ago, computer science students held the first ever “Hack TJ,” a programming competition in which 250 students built web and mobile apps. The next year, it was held at Microsoft’s offices in Washington, D.C., and the number of participants doubled. Correction: This article initially stated that the high school's renovations will be completed in 2017 rather than late 2016.